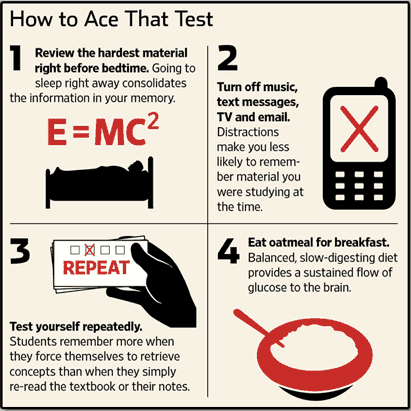 WSJ: Toughest Exam Question: What is the best way to study? Here’s a pop quiz: What foods are best to eat before a high-stakes test? When is the best time to review the toughest material? A growing body of research on the best study techniques offers some answers. In his junior year of high school in Cary, N.C., Keenan Harrell bought test-prep books and subjected himself to a “relentless and repetitive” series of nearly 30 practice SAT college-entrance exams. “I just took it over and over again, until it became almost aggravating,” he says. Continue reading the full article at The Wall Street Journal’s website. What study techniques work for you?